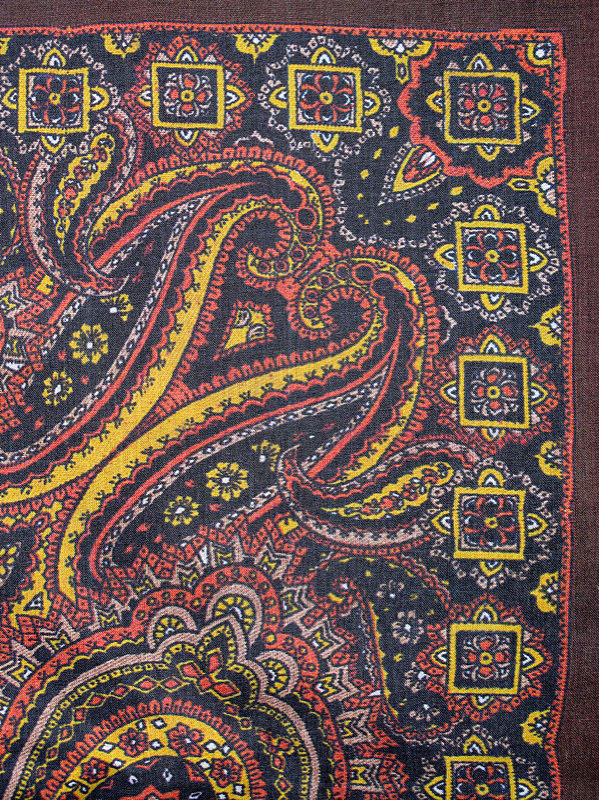 From what I gather, the production department of Doctor Who purchased up to twenty of the red paisley hankies used during Sylvester’s first and second season (see right). For his third (and final) series his costume was revised, with a chocolate jacket (instead of beige), and a complimenting brown hanky around his panama hat to replace the existing red one. 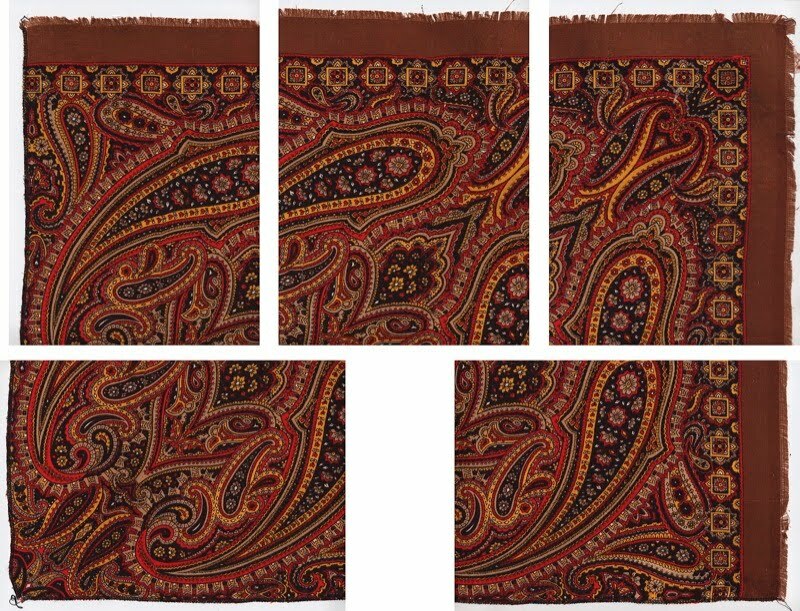 Fewer brown hankies were bought, so they are quite rare and hard to find. On top of this they were not simple colourway of the existing red ones, but were a segment cut from a much bigger (probably) scarf. Luckily I recently managed to get access to one of screen-used panama hats, with a rare brown hanky around it (see left). I was able to get some top quality scans, from which I can create a replica. I also got my hands on a red one too (see above), and also scanned this with the intention of revising my artwork for this at the same time. 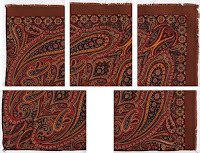 Shown above is a reconstruction of the full-sized scarf. The top right corner is the only screen-used part. Great as it has been to finally get to see the real thing, it has given me a number of dilemmas I need to overcome before I can produce a usable replica. The quarter segment I have has frayed edges on the outside (top and right in the picture above) and has a surged (overlocked) edge on the others (bottom and left in the picture above). On top of this, the square this creates is actually not big enough to actually tie around the hat. The screen-used panama hat I obtained has the brown hanky attached with double-sided sellotape, with the tips of the hanky barely touching each other (see left). When the hanky was remove from the hat, a lot of care was needed to clean off the residual glue left behind by the tape. I want to make something that is practical, but yet as accurate as I can make it, but on this occasion I think I need to go a little off-pisté to make it work. 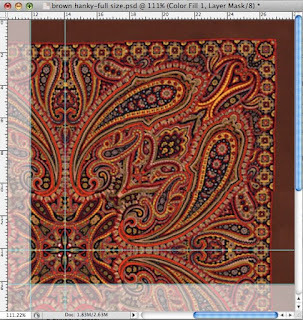 My plan is to make the hanky to the same dimensions as the red ones I have been doing as these have worked perfectly for the buyers that have them. However, I do not want to simply enlarge the artwork I have, as this will not look ‘right’. 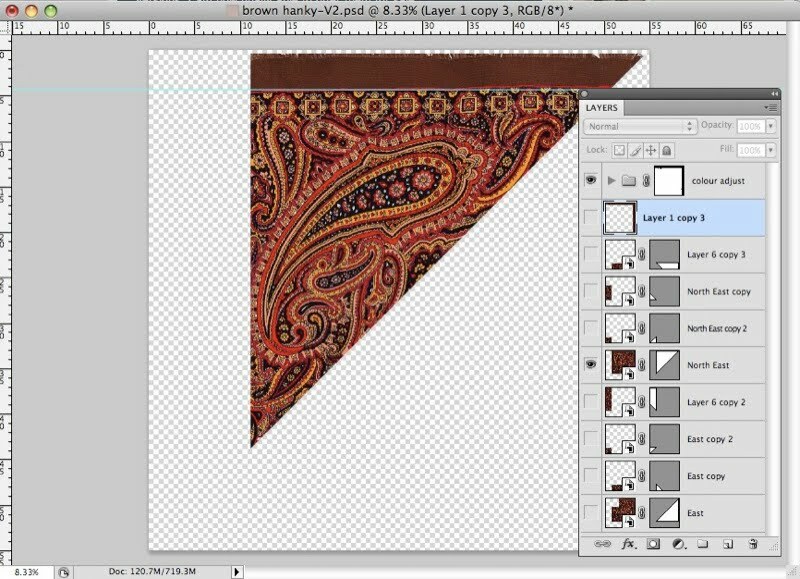 What I will do instead is recreate the rest of the scarf as if I was the wardrobe department at the time, then from it crop a larger area to make the finished hanky. Shown above is a demonstration of the new crop I will make, repeating the available design to make it big enough. Firstly I scanned the hanky in large chunks (see left), as I do not have access to a scanner which can do it in one piece. 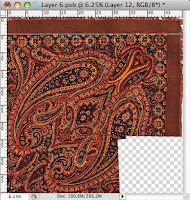 It is always very difficult to scan fabric without it stretching and skewing, so I have a clever little technique to correct for the inaccuracles that will enevitably be hinherant in the scan. 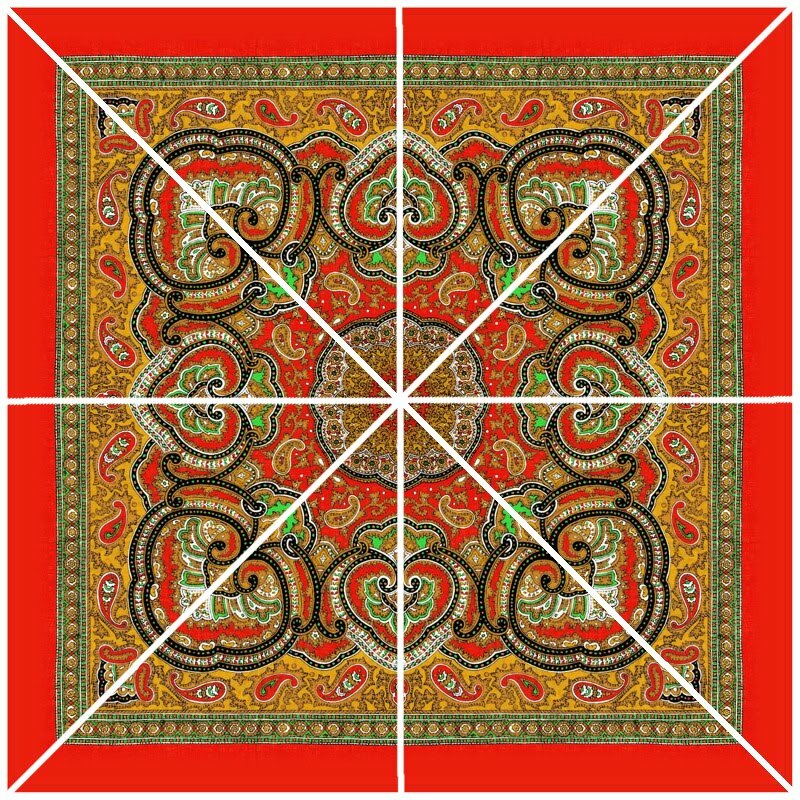 If you cast your mind back to when I did the original artwork for the Red Hanky, I reconstructed the full design by making up a eighth of it and repeating it (see right). This is the basic method I will use again, though this time around with a little more thought. 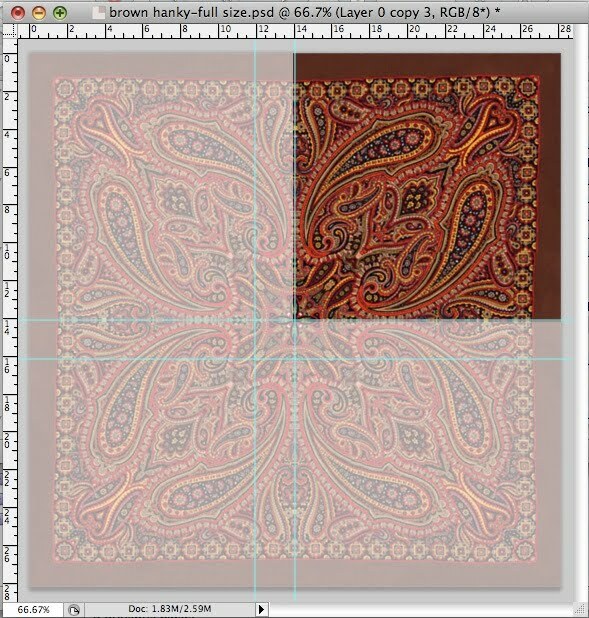 I then montage the scans together to make up the design. I only need to worry about doing a triangle-shaped area, so the bit missing at the bottom will not matter (see left). I then turn this group of layers into a Smart Object and cut a pin-accurate clipping mask around it to the correct shape (see right). 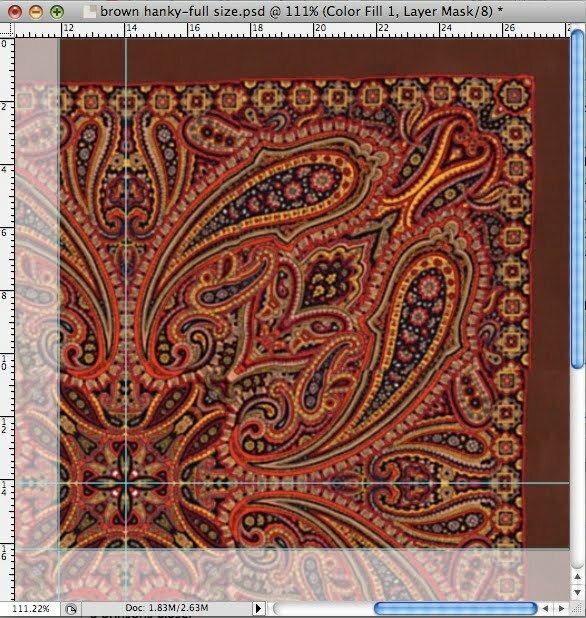 I can then duplicate this Smart Object layer and rotate or flip it as needed to complete the full design of the scarf, though most of it falls off the pasteboard area of the image (see left). 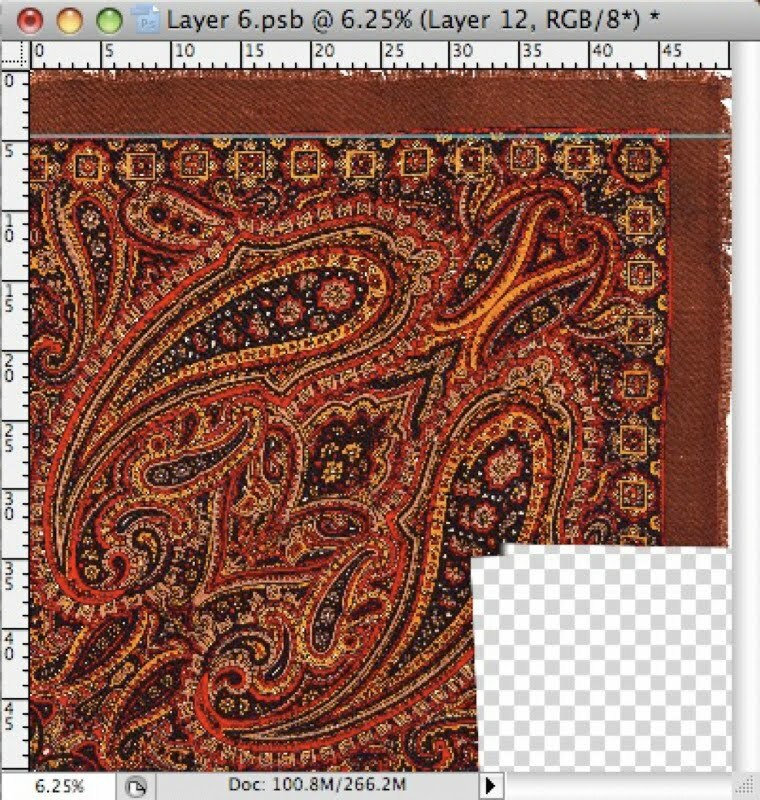 The clever part of doing it this way, is that when I double-click on any of the Smart Object layers, Photoshop opens up the layer group I created at the start and I can then adjust my retouching for in misalignments (see right). Then when I save this down, because each of the segments was duplicated from the one original layer, ALL the copies of it update automatically, hence a minor tweak will cascade throughout the artwork. 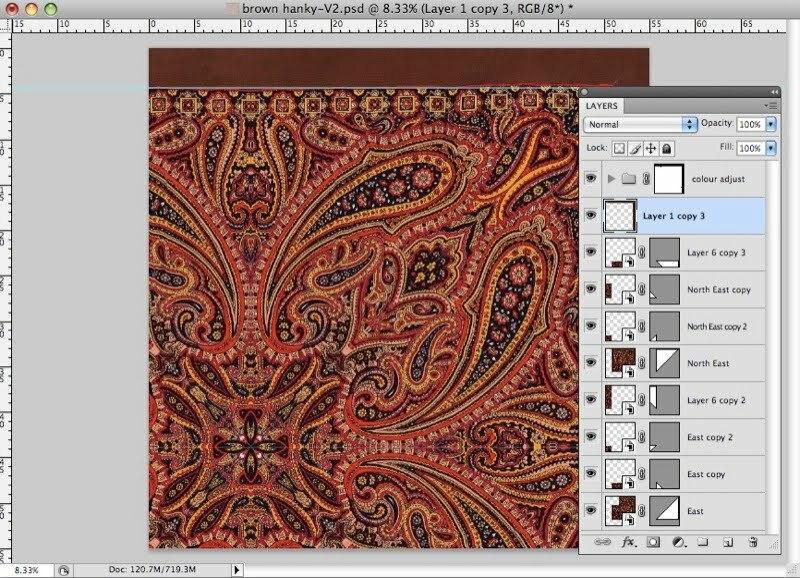 Once this is all done and I’m happy with the result, I can then start colour testing the image with Spoonflower. I have already done a couple of these tests, and am now pretty happy with the results. 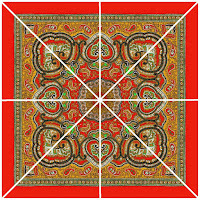 The only fly in the ointment came when I was ready to order my first run of these new hankies. Up until now I have been using a bamboo-cotton mix fabric, which has a silky texture and a very fluid drape, so was just about right for the hankies. 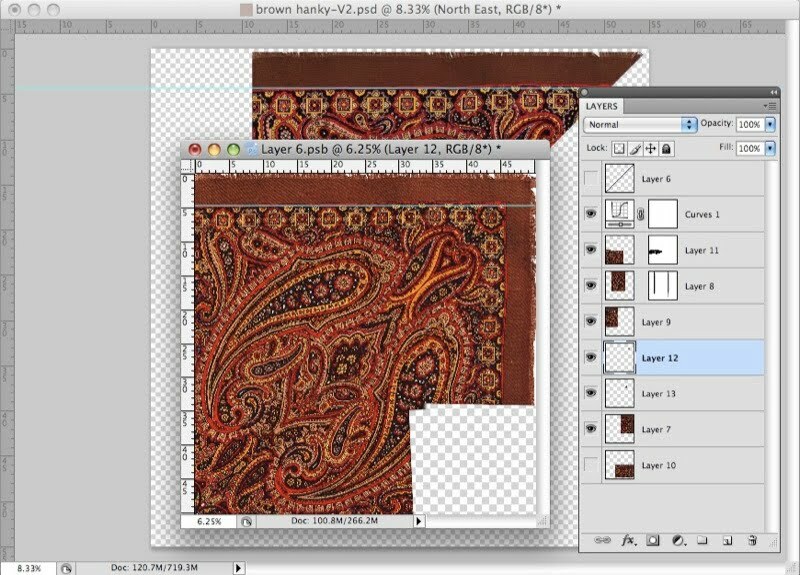 Annoyingly this has now been discontinued by Spoonflower’s supplier, so is not available. Drat! 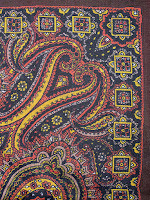 The have, however, brought on board a new material as a sort of replacement, which is called Cotton Lawn. It is half the weight and apparently has a gauzy (semi transparent) quality to it. To start with I was a little skeptical about it, but having received a sample, I find it is almost a better match to the screen-used props anyway! Which is a result. 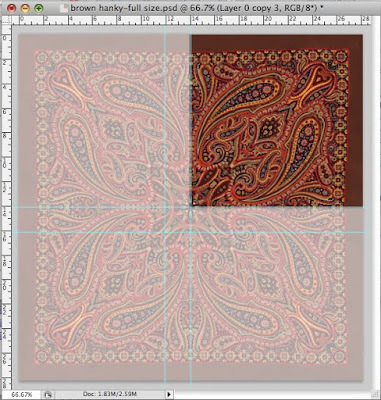 So I have now ordered a sheet of red and brown hankies – all to new, super-clear screen-accurate designs! Check back real soon to see how they have come out – and how to get your hands on one for yourself!! I look forward to seeing this new material!